Signalisation project "The Retirada and Alt Empordà’s exile routes"
On 26 January 1939 the rebel troops of General Franco occupied Barcelona. The Spanish Civil War had practically come to an end and the victory of the rebel army was imminent. However, for all those who had fought on the side of the democratic legality that the Republic embodied, a period marked by repression and silence was beginning. In order to avoid this situation, thousands of citizens – both soldiers and civilians (men, women and children) – had to flee and leave behind their work, home and family. It is estimated that between late January and early February 1939 some 350,000 people fled to France through El Pertús, Portbou and other parts of the district of Alt Empordà. 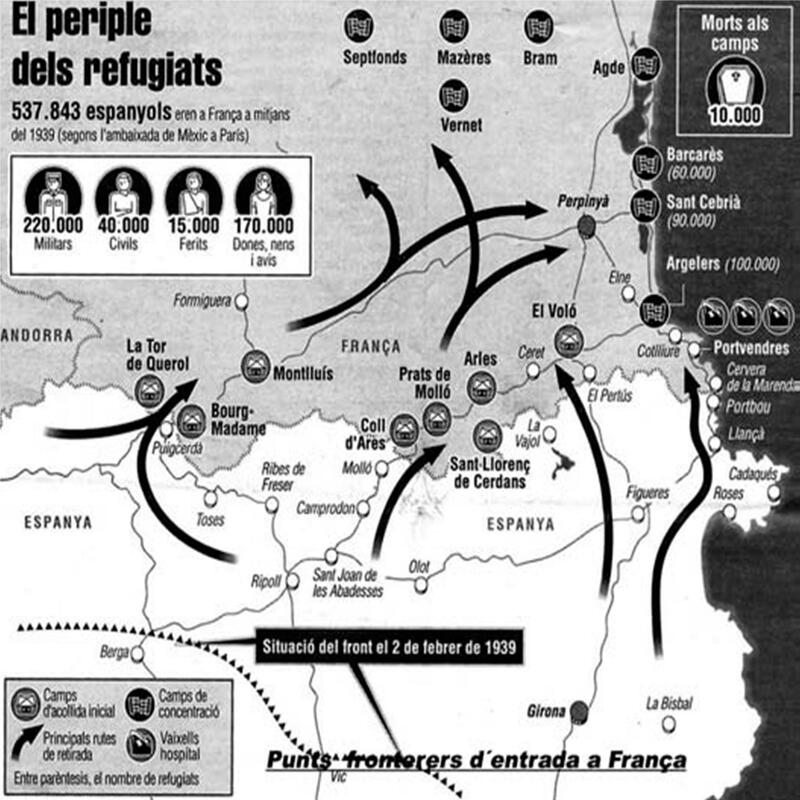 If we add the rest of the citizens who crossed the border using routes in the districts of La Cerdanya and El Ripollès, the number of people who went into exile reaches almost half a million. Once they had crossed the border, a journey marked by uncertainty, cold, hunger, fear and death began. Owing to the measures taken by the French government, which basically consisted of internment in unsafe concentration camps that did not provide the most basic habitation or health conditions, despair and frustration overwhelmed the Catalan and Spanish refugees. It was not long before half of them returned to Franco’s New Spain. Those who remained in exile – some 200,000 – suffered the effects of the Second World War and, in some cases, even deportation to the Nazis’ camps. In the end, the majority of the exiled Republicans established themselves in France and also, to a lesser extent, in the Soviet Union and other European countries. However, some significant groups ended up in various countries of America. This signposting project brings together the villages and sites in the district of Alt Empordà that were most important at the time of the great Republican exodus. 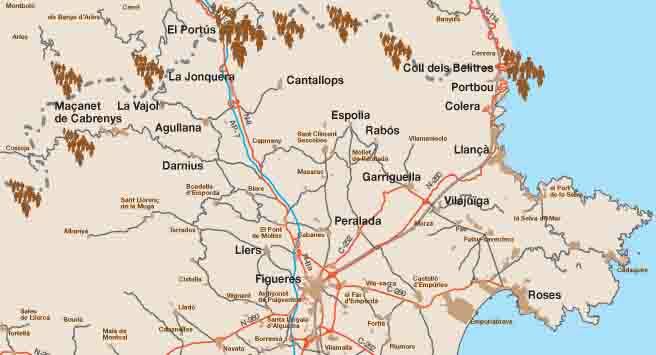 Even though the district’s most important border crossings are La Jonquera and Portbou, it also includes other secondary routes such as the high-mountain villages situated at L’Albera and Les Salines, and the municipalities that played an important role in the resistance and in evacuating the last Republican military units, such as Figueres, Roses, Vilajuïga, Garriguella, Llançà, Colera, Llers, Darnius, Maçanet de Cabrenys, Cantallops, Espolla and Rabós. Some of the most significant places to which reference is made are the pass of El Pertús (La Jonquera); the pass of Els Belitres (Portbou); Perxés Farm (Agullana), which was the last seat of the Government of Catalonia; the pass of Manrella (Agullana); the pass of Lli (La Vajol), where the heads of the Republican government crossed; the farm Can Barris (La Vajol), headquarters of the President of the Republic; Sant Ferran de Figueres Castle; Peralada Castle and D’en Negrín Mine, where the Republic kept its works of art during the Civil War (La Vajol). The realization of this signal forms a memory area where the shaft and acts as MUME dinamitzador agent. The Girona zone were the main stage of the withdrawal of hundreds of thousands of people, including leaders of the Generalitat, the Spanish Republic and the autonomous Basque government. It was also the scene of the withdrawal of the bulk of the army of Catalonia, who went to North Catalonia, the first refuge of the great mass of the vanquished, who were interned in "camps and concentration" like Argelers, Sant Cebrià, El Barcarès, Rivesaltes, etc. and ended up mostly in France, in Latin American countries, the Maghreb or returning to New Spain under Franco. At the same border, the town of La Jonquera was the great door of the Republican exodus. The Exile Memorial Museum (MUME), opened since late 2007, serving as the core dynamic of memory spaces of the region of Alt Empordà and much of the Vegueria of Girona. The origins of the project involving various institutions such as the Exile Memorial Museum (MUME), the Alt Empordà Regional Council and Democratic Memorial. This action aided by the Democratic Memorial is part of the thematic area "Spaces of Memory and Exile Border Areas", within the actions planned by the Network of Memory (Action Plan Memory Spaces Catalunya, Department of Interior , Institutional Relations and Participation of the Generalitat de Catalunya, 2007). The objectives of this project are empowerment and dignity of the memorial heritage and areas of exile in the Pyrenees Girona main stage of the withdrawal, the expansion of the museum space in the territory and the most important steps in exile in the area, desire to expand signaling in the neighboring regions (up Puigcerdà initially) and Northern Catalonia in a unified and MUME joint and make a cultural center of reference in the Pyrenean border area on similar themes. Democratic Memorial information leaflet linked to signaling Retreat and Ways of Exile (Alt Empordà). Signaling done so far includes 17 villages with 27 points of information and a total of 30 signals between boards, monoliths, banners, point tracking, panoramic lecterns, easels panoramic simple and townhouses.